In the 60s and early 70s, ITC ruled the roost when it came to action-packed TV shows. Every one was packed full of ridiculous plotlines, featuring jet-setting secret agents attracting the ladies whilst driving top marque sports cars in all manner of cool locations. They worked because they packed a top-notch cast and some impressive writing into each 50-minute episode and they stuck in your mind because of an annoyingly catchy theme tune, thrown out by (more often than not) by John Barry. Well, there’s no better time to discover or re-introduce yourself to these shows. Check out ITV4 for some of the best every evening, including Man In A Suitcase, Randall and Hopkirk (Deceased), The Zoo Gang, The Champions, Department S, The Saint, The Persuaders, Jason King and UFO. And here at Modculture, we’ll be reviewing each one as they hit DVD. 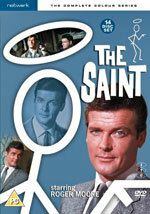 New online are reviews of The Saint – Complete Colour Series and The Adventurer. We’ll have the best of the rest as soon as they hit the shelves.